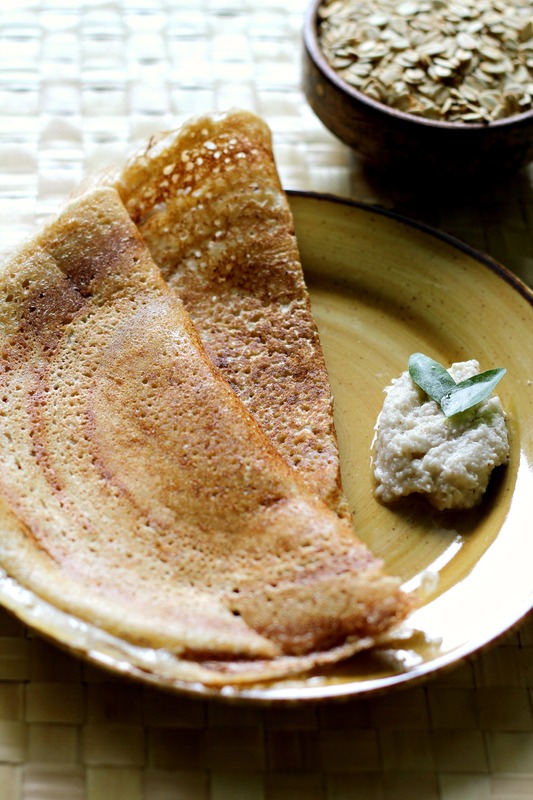 Oats dosa, a modern take on the traditional rice & lentil based dosa. The difference is that while the latter is made from fermented batter this particular recipe isn’t. Since oats has been a recent favourite in my home I totally love experimenting with it. While I have added it to cakes and bakes in the past, in the recent couple of years I have moved to creating savoury breakfast options. A savoury bowl of oats is so comforting and a great way to start your morning. 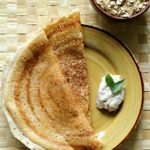 The oats dosa then must be on your breakfast menu because it is just so simple and easy to make and pairs very well with sambar or chutney or leftover curry, just like a regular dosa would. Should you wish to reap the benefits of that extra labour involved in fermenting the batter, you will can do that as well. Fermented foods are known to be excellent for the gut. 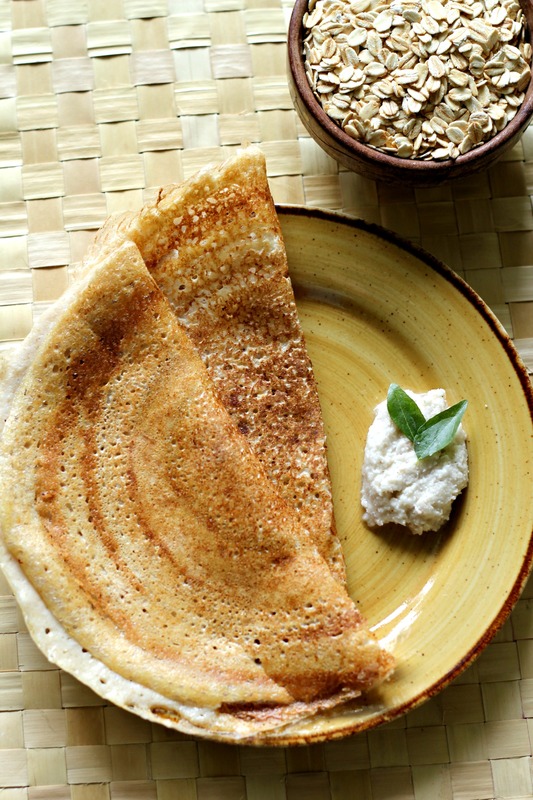 However, if you are looking for a quick option, then this dosa is just for you. If you have been wondering where I vanished for a whole month, well, home and kids kept me busy and plus my website had to undergo some maintenance work which prevented me from posting anything new. I have been working in the background on a few recipes which I hope you will like. How has the first month and a half of this year been for you? Well, in my case, the kids started school around the 7th of Jan and since then I have been trying to get out of my holiday hangover and get back to the routine. I find it very hard to cope up with such long holidays as my schedule goes for a toss. I prefer school days as they give me my much needed space and time. Waking up at 4.55am is the only grouse I have during school days but as much as I love spending time with my kids I feel the need to accomplish some of my own goals on a daily basis in the peace and quite which are priceless! I dread the mid-term break that is threatening to jeopardise all my blog related goals! I hope to prepare as many posts as I can before that happens! So while I go and write another couple of recipes why don’t you go and check out this recipe? 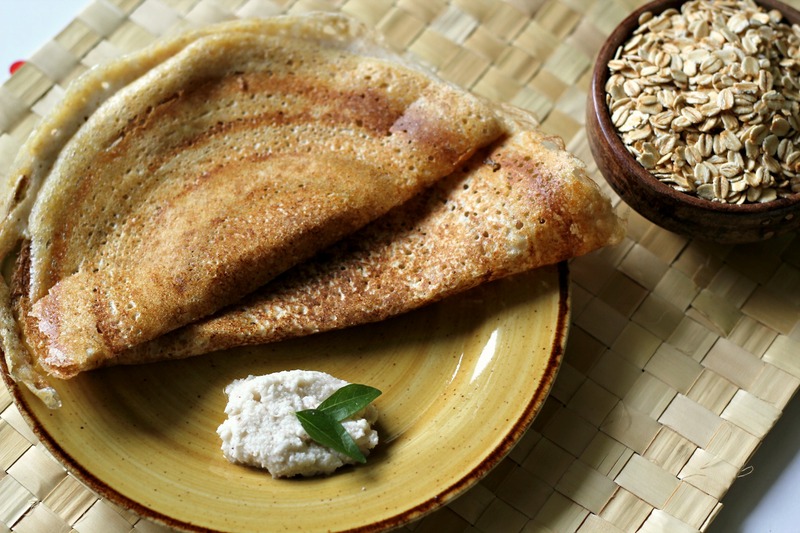 Easy, quick & healthy oats dosas are a perfect way to start your mornings! They make for a great lunchbox or anytime snack option too as they pair very well with any accompaniment of your choice! Wash the urad dal and soak it in plenty of water for 3-4 hours. Soak the oats too (without washing) in a separate bowl for the same amount of time. After 3-4 hours, discard the water and grind the urad dal to a fine paste. Transfer to a bowl. Grind the oats too with minimal water (use the same water that the oats soaked in). Mix both the batters together and add water if required to get a batter of flowing consistency - neither too thick nor too thin. Add salt to taste. Before you repeat the process, sprinkle the tawa with some oil, wipe with a clean cloth and continue. This will bring down the temperature of the tawa if it has heated up too much. I used regular Quaker quick cooking (not instant) porridge oats and pulsed it in a mixer grinder. Can we use instant oats too for this recipe?